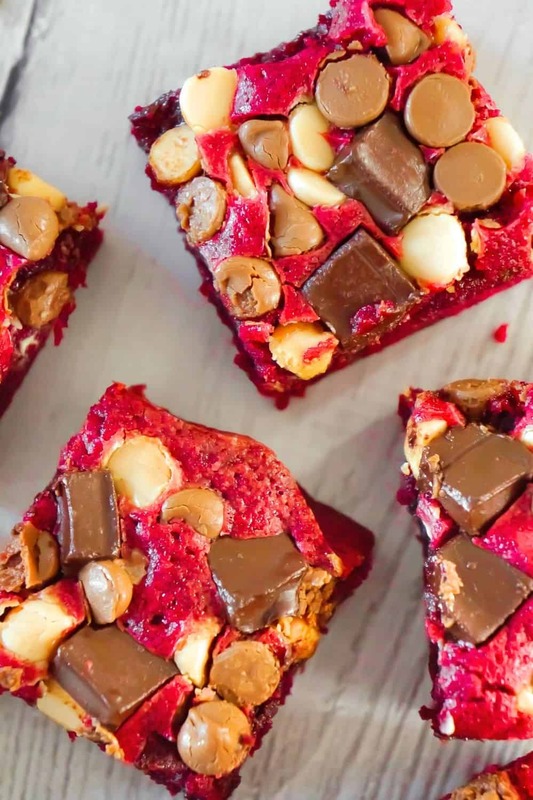 Red Velvet Brownies are delicious and chewy homemade brownies loaded with white chocolate chips, dark chocolate chunks and milk chocolate chips. 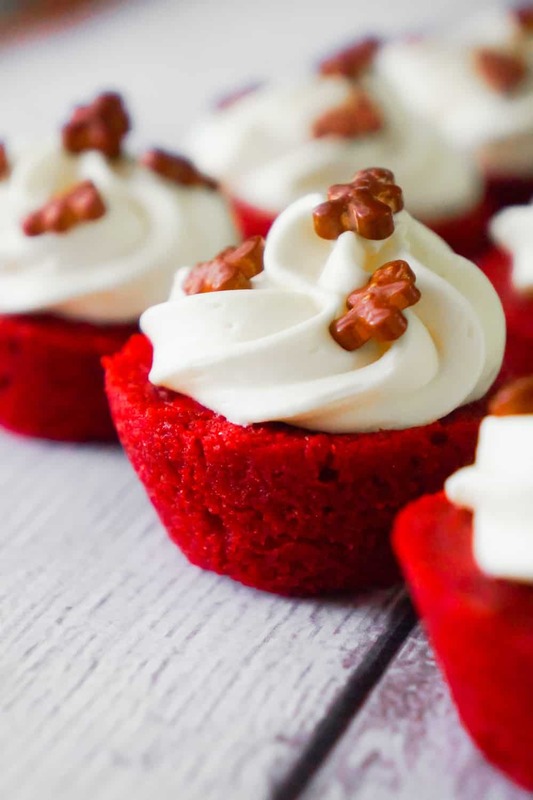 These decadent red velvet treats are the perfect Valentine’s Day dessert. 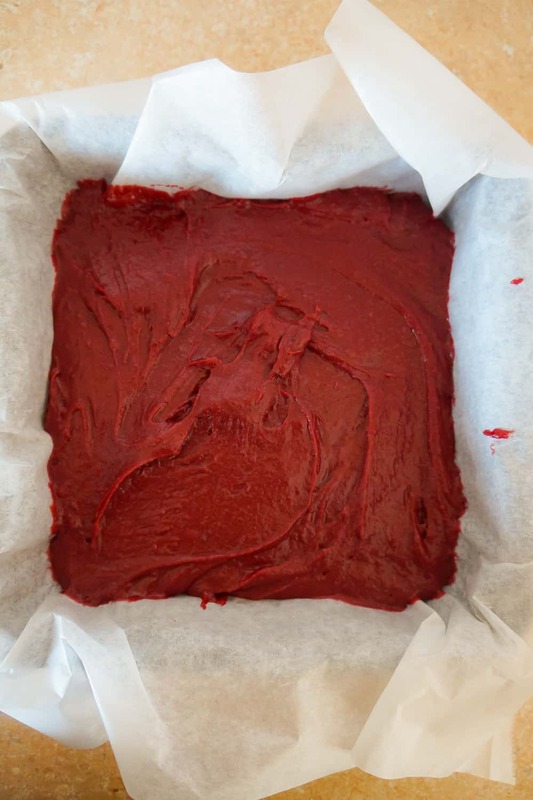 To make these red velvet brownies, I started by dumping some light brown sugar, granulated sugar, melted butter, salt, eggs and red food colouring into a large mixing bowl. I stirred all of the ingredients together until they were fully combined. Then I added some flour and cocoa powder to the bowl. I folded the flour and cocoa powder into the wet mixture with a rubber spatula. I lined an 8 inch square baking pan with parchment paper. Then I poured the brownie batter into the pan and spread it out evenly. I sprinkled white chocolate chips, milk chocolate chips and dark chocolate chunks on top of the brownie batter. Then I baked the brownies until a toothpick inserted in the center came up with just a few crumbs. I allowed the brownies to cool for few minutes in the pan and then used the parchment paper to lift the brownies out of the pan to continue cooling. I waited until the brownies had almost completely cooled off before slicing them. These red velvet brownies are moist, chewy and loaded with three kinds of chocolate. If you are looking for a decadent chocolate dessert, then you need to try these Red Velvet Brownies! 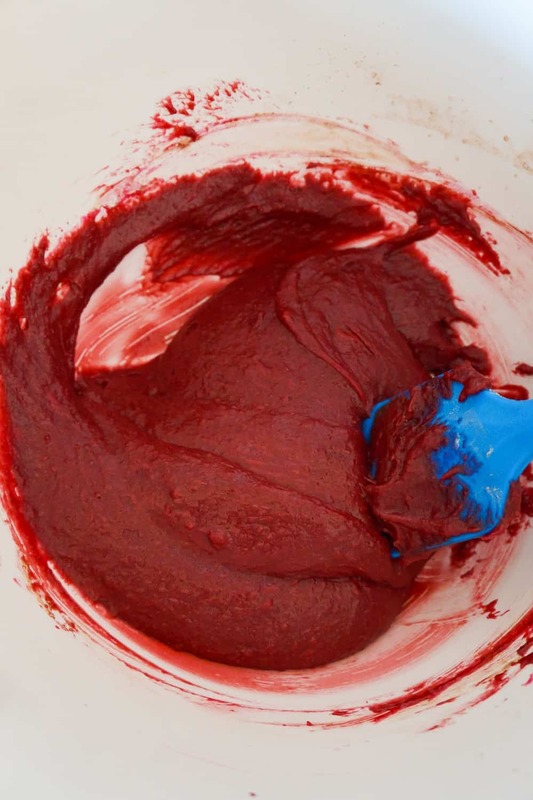 Another delicious red velvet dessert recipe. 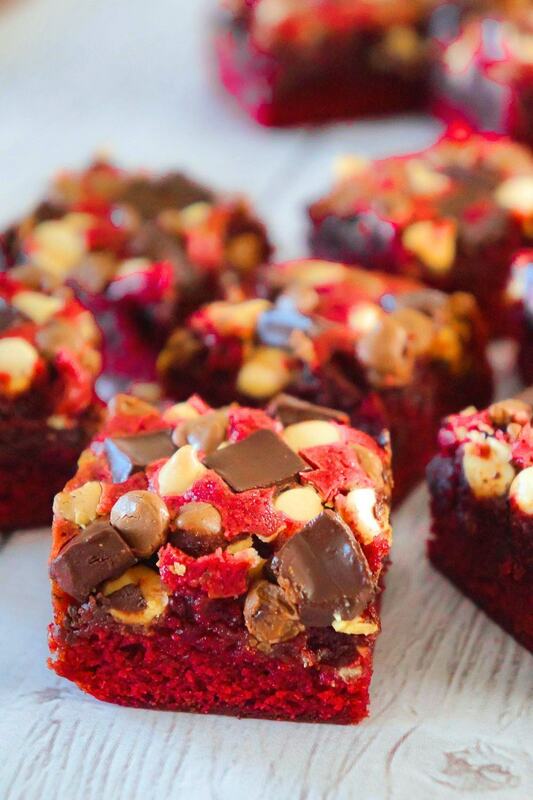 Check out these Red Velvet Brownie Bites! 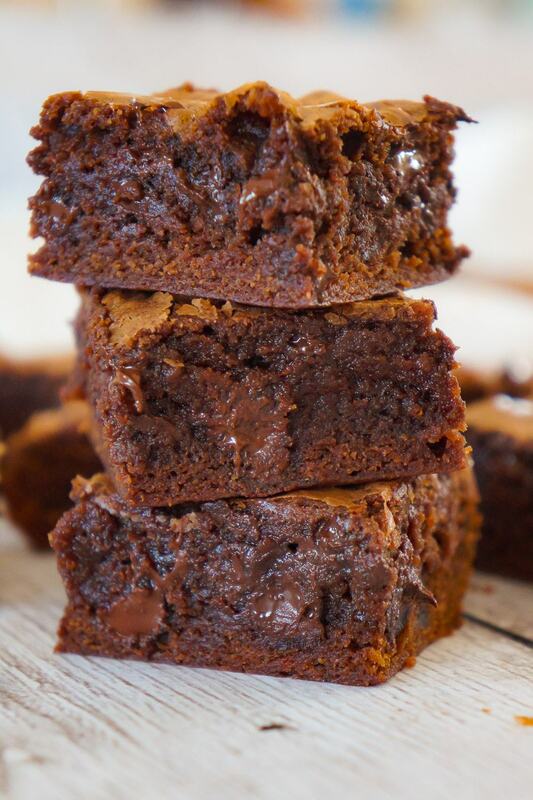 Another decadent brownie recipe. 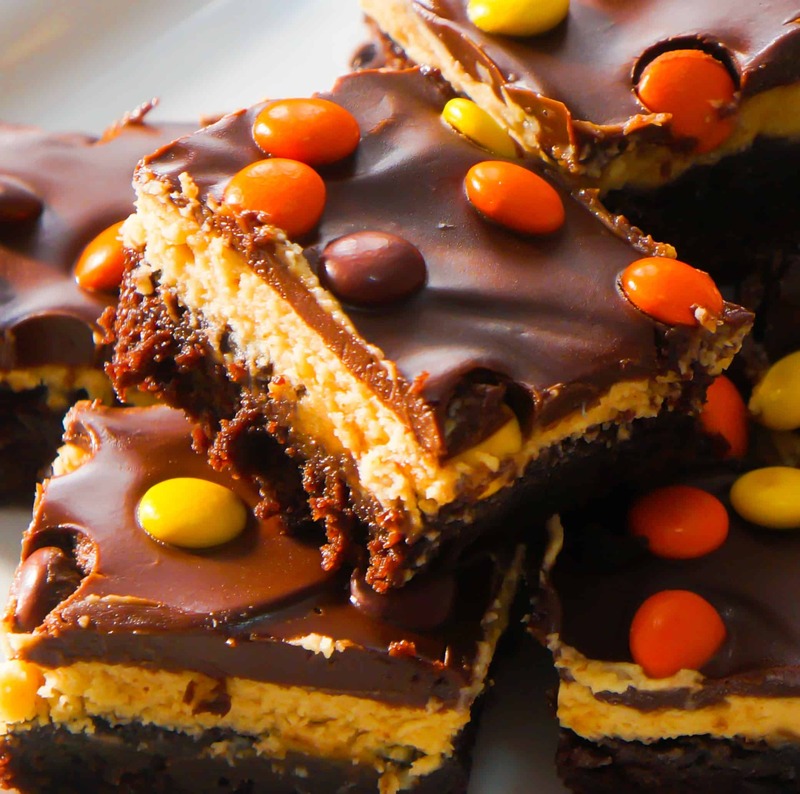 Check out these Reese’s Peanut Butter Cream Cheese Brownies! 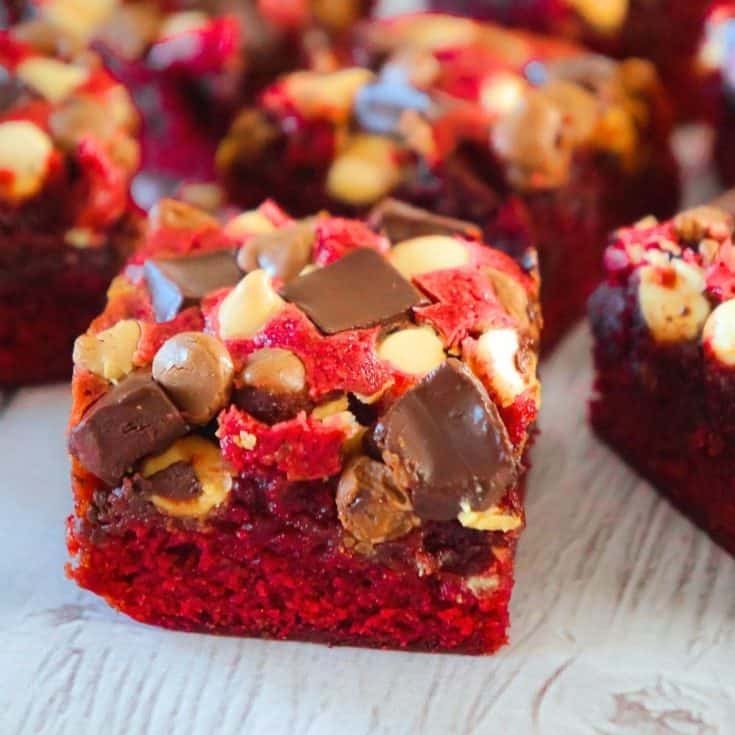 Red Velvet Brownies are delicious and chewy homemade brownies loaded with white chocolate chips, dark chocolate chunks and milk chocolate chips. 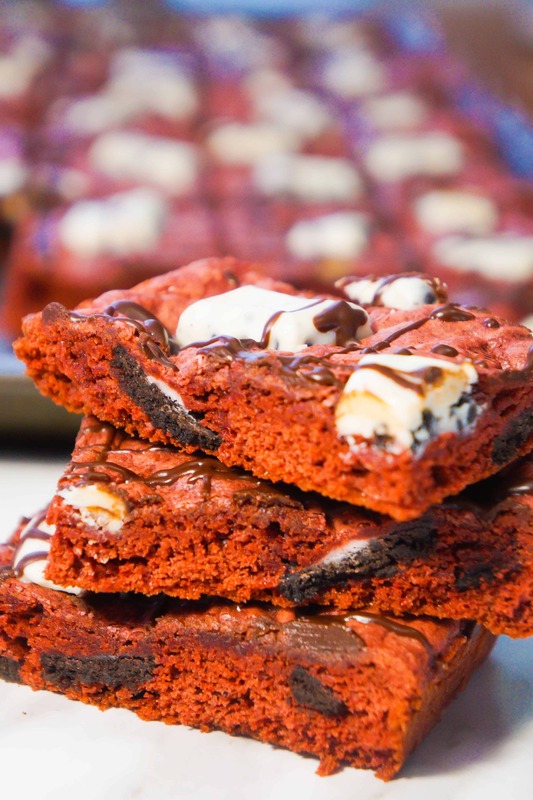 These decadent red velvet treats are the perfect Valentine's Day dessert. 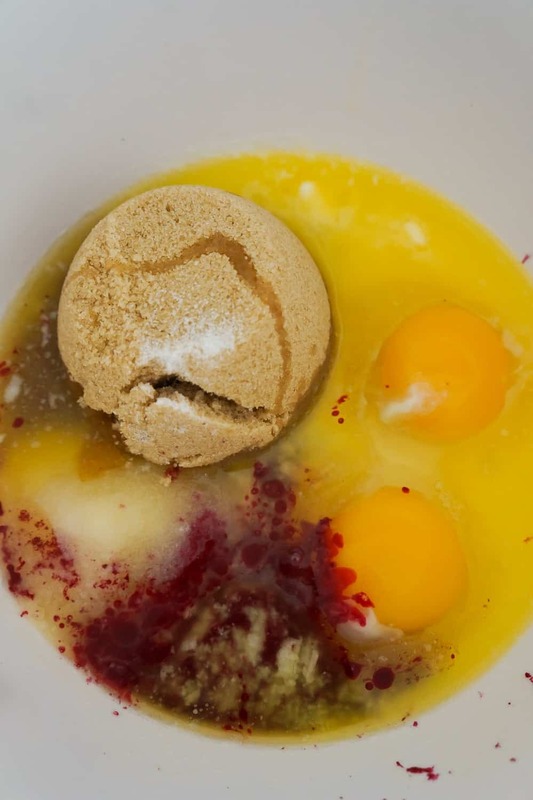 Dump brown sugar, granulated sugar, melted butter, salt, eggs and food colouring into a large mixing bowl. Stir well. 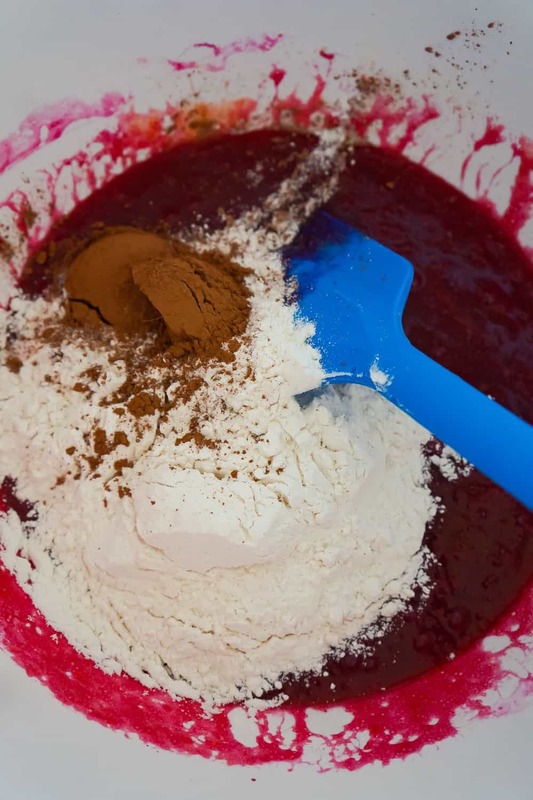 Add the flour and cocoa powder to the bowl and use a rubber spatula to fold them into the batter. 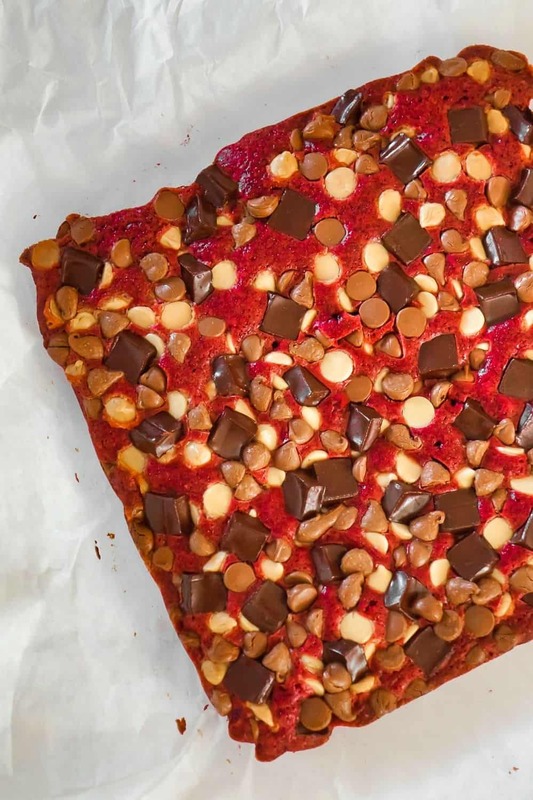 Pour the brownie batter into the baking pan and spread it out evenly. Sprinkle the white chocolate chips, dark chocolate chunks and milk chocolate chips on top of the brownie batter. 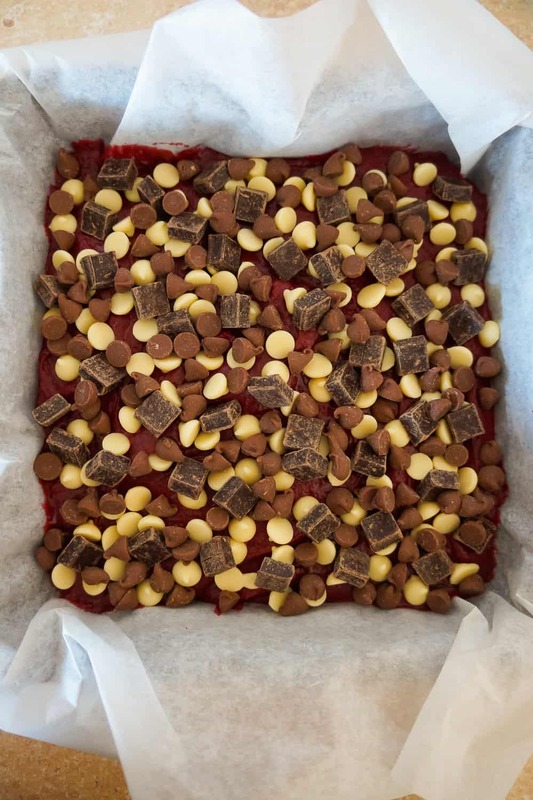 Place in the oven and bake until a toothpick inserted in the center of the brownies comes up with just a few crumbs. 33-36 minutes. Allow the brownies to cool in the pan for a few minutes and then use the parchment paper to lift them out. Let the brownies cool almost completely before slicing. Loved these!! So easy and so chewy. I just switched the flour out to gluten free and it worked out great! !